When I was made redundant the week before Christmas 2017, I had two options. I could go on the two-week trip I had booked to visit my boyfriend in Australia, then fly home in the new year and start job-hunting. Or, I could extend my trip indefinitely and travel the world while pursuing a career in writing. It was a no-brainer. I changed my return flight, filled the biggest suitcase I had, and flew to the other side of the world. I landed on Christmas Eve, ready to begin a new chapter in my life as a remote travel writer and copywriter. Since then, I’ve worked with a range of clients, contributed articles to international travel publications, and visited over 12 different countries across three continents. How did I make it happen? My solution was to develop a three-pronged strategy: I reached out to my existing contacts, emailed brands and companies I was interested in, and updated my website and LinkedIn page. It worked, and a few weeks later, I was writing a blog post for a travel company I’d emailed while drinking from a coconut in a hotel bar on the Balinese island of Nusa Penida. 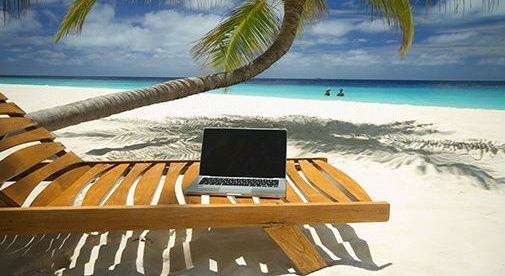 A month later, while relaxing in a hammock on the Gold Coast of Australia, I was writing a thought-leadership piece for a tech company that had found me on LinkedIn. It’s liberating. This time last year, I was working in an office. At my interview for the job, I can remember my future boss telling me that there was “no typical day,” at the company…except, of course, there was. There was the same hour-long commute in the morning, the same lunch menu in the same canteen, and the same drag of the afternoon before the same hour-long commute in the evening. Now, not only am I doing what I love, but I can work when and wherever I choose, which means that there really is no typical day’s work. In Bali, I’d write during the afternoons, when thunderstorms break over the islands. On the Gold Coast, I’d sandwich my writing in between a morning and evening surf. During a rainy camping trip in Scotland, being on deadline for a travel article was an excellent excuse to hole up in a pub and wait for the storm to pass. Moreover, just as important as choosing when I work is being able to choose when I don’t—an option that means I can both fund traveling and enjoy it. In Japan, I earmarked a long weekend so that my boyfriend and I could go hiking in the mountains. In Singapore, I decided not to work, so that we could make the most of our three-day trip. And when we got engaged a few months ago, it was easy for me to find time for us to celebrate with friends and family.